Mercedes quarterback Israel Alegria with a handoff during football practice at Mercedes High school on Monday, August,6, 2018, in Mercedes. Goodbye to the dogs days of summer, when coaches like Mercedes’ Roger Adame could only hope his athletes were working out to be in football shape on the first day. The boys of the gridiron are back, and the coaching staffs can tell who prepared and who needs an extra lap for conditioning. The Tigers got started early, just after 6:30 a.m. for their first portion of two-a-days. Mercedes will replace key players at middle linebacker and brothers Matthew and Marc Ledesma on the offensive side of the ball. Incoming senior Israel Algeria is ready to step into the role of starting quarterback for the Tigers. 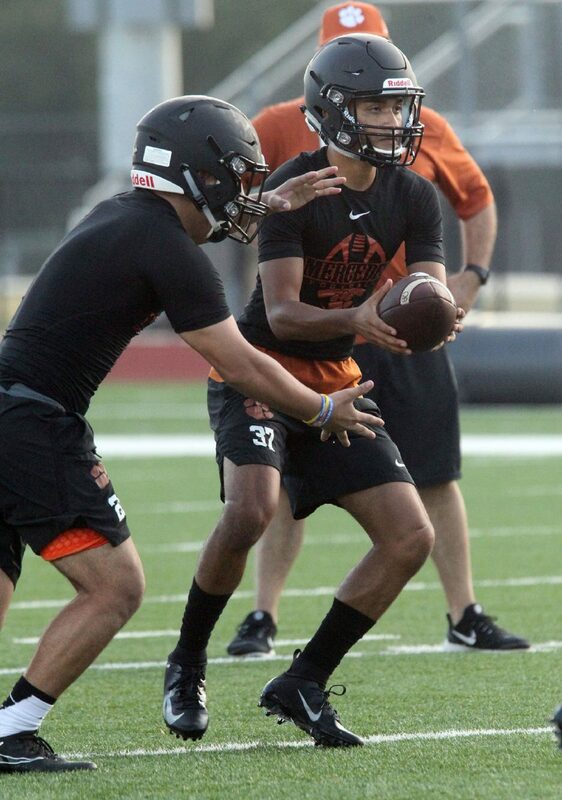 He’s projected to be under center when Mercedes kicks off 2018 with a Saturday date against Edinburg North.